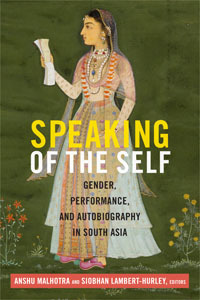 Speaking of the Self: Gender, Performance and Autobiography in South Asia is co-edited with Anshu Malhotra and examines a range of women’s autobiographical writing from South Asia. Many consider autobiography to be a Western genre that represents the self as fully autonomous. This volume challenges this presumption by examining a wide range of women’s autobiographical writing from South Asia. Expanding the definition of what kinds of writing can be considered autobiographical, the contributors analyze everything from poetry, songs, mystical experiences, and diaries to prose, fiction, architecture, and religious treatises. The contributors find that in these autobiographies the authors construct their gendered selves in relational terms. Throughout, they show how autobiographical writing—in whatever form it takes—provides the means toward more fully understanding the historical, social, and cultural milieu in which the author performs herself and creates her subjectivity. Speaking of the Self: Gender, Performance and Autobiography in South Asia (Duke University Press, 2015). This entry was posted in News and tagged Gender History, South Asia on November 5, 2015 by Alice Johnstone.